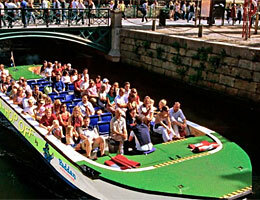 Sightseeing trips in Gothenburg by boat. 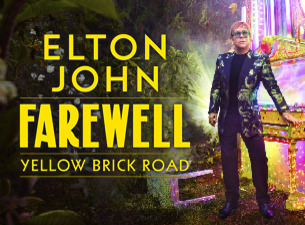 Book your tickets in advance before you arrive to Goteborg. Discover Gothenburg by boat. 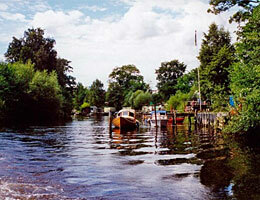 There are also boat trips in combination with bus. Discover Gothenburg City with Paddan or go by a bigger boat to the archepilago. 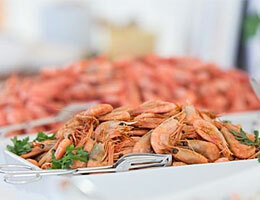 What about a brunch cruise or eat delicious shrimps from the sea on a shrimp and salmon cruise. 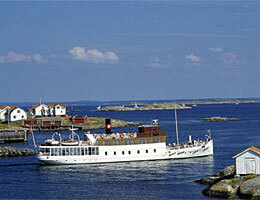 Below we present some of the trips by boat that Gothenburg offers. 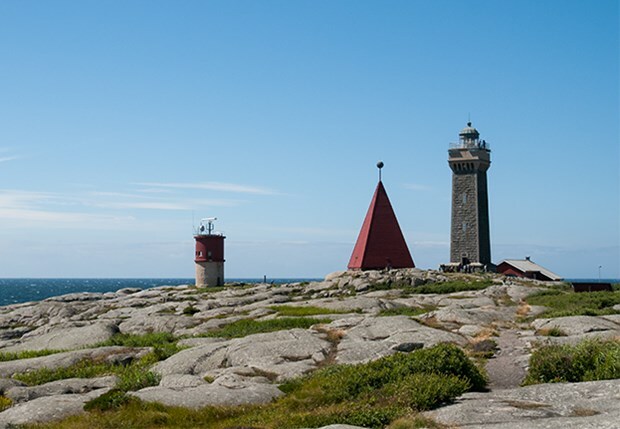 Evert Taube grew up at Vinga as his father was employed as a lighthouse keeper at Vinga lighthouse 1889-1905. Combine one day to go both by boat and bus. You stop at 12 different stops. This means that you can see Gothenburg from different perspectives. You decide how many times you want to go on and off. 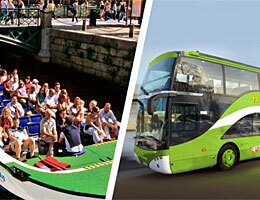 Hop on / Hop off is a very good option to see and discover all of Gothenburg's sights. With a hop on / hop off boat ticket you are traveling by boat from different selected places in town. You can hop on and off how much you want and just wait for the next boat. Departs from: Kungsportsplatsen and 5 more places. You go on board the boat at Paddan-Kungsportsbron next ungsportsplatsen. The tour takes you through the old canals from the 1600s and under low bridges and out of the harbor. 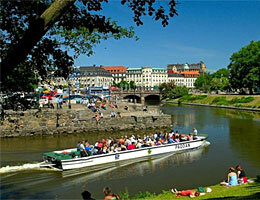 Here you will hear about the history of Gothenburg from the knowledgeable guide. During the trip you pass landmarks such as the Opera House, Feskekörka, the lipstick, the old shipyard areas, green parks and Gothenburg Typical old house "Landshövdingehus" in Haga. Take a guided boat ride along Säveån. Paddan boat takes you through the old moat, Great Harbor Canal through the 13 km long Säveån out to the Göta Älv. A guide tells the story hos Gustav II Adolf founded Gothenburg and Lödöses history. During the tour you will pass buildings, shipyards and docks. On the way back, there is time for questions. Book a tour around Hisingen in about 4 hours. 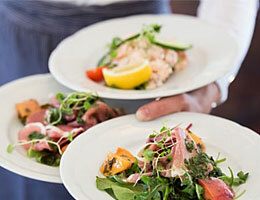 Order something to eat from the a la carte menu. The food is not included in the ticket. You pass through the river and Nordre River Waterway via Björkö Fjord and back to the port of Gothenburg. Your guide will tell you about everything that you pass. 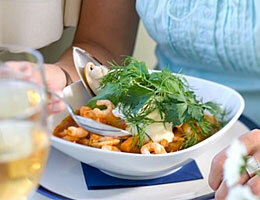 The ticket includes guided tour, boat trip and reserved place in the dining room. 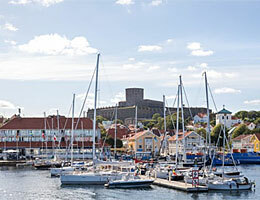 Take the small archipelago tour of about 2.5 h and discover Gothenburg archipelago. Your guide will tell you about about what you pass. You go through the Port of Gothenburg to the south of the archipelago. You can buy snacks and drinks on board. 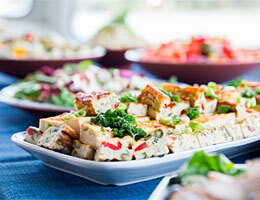 Enjoy a delicious brunch at M / S Carl Michael Bellman on Saturdays or Sundays between April - Otober. 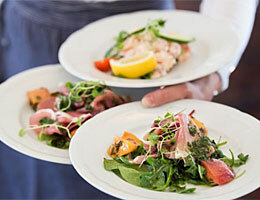 You are travelling in the Gothenburg archipelago on a three hour brunch cruise. The brunch s cooked on board and you can choose from salmon, herring, meatballs, salads, cheese platter and do not miss the dessert table. You look through the large panoramic windows of the ground floor and do you want to go out - go up on the sun deck and enjoy the view. We reserve the right for any typographical errors or changes in the content and prices. Images: Strömma.